All rides start at the main bathrooms in the lower parking lot, "1" on the map. Unless otherwise indicated, always take the main trail when you get to an intersection. This ride is 6.4 miles with about 900' of climbing overall. The trail is mostly doubletrack or wide singletrack, with a firm and fairly even surface, so it isn't technically challenging. It is an out-and-back ride, so you can turn around and return at any time. If you would like to ride further, you can combine it with the Intermediate ride. 1. From the bathrooms, cross the paved road, ride down the short dirt trail to the left of the steps, turn right onto High Rd and cross the bridge. 2. Turn sharply right onto the Grasslands Trail and ride up the hill. A. Cross Mulholland Hwy and continue on the singletrack on the other side. B. Cross the bridge and continue straight onto Las Virgenes Fireroad. C. Turn around when you get to De Anza Park and return. B. Bear left onto the Grasslands Trail, then cross the bridge. A. Cross Mulholland Hwy and continue on the trail on the other side. 2. Turn sharply left onto High Road and continue back to the beginning. 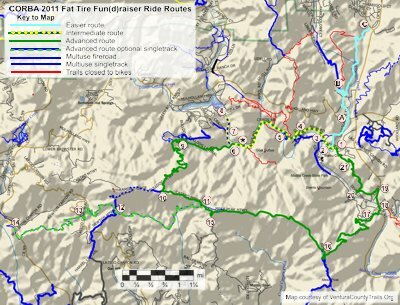 This ride is 6.6 miles long with about 800' of climbing overall. The trail is mostly fireroad, but there is one singletrack section about a half mile long that goes through the creekbed that is rocky and somewhat technical. It is an out-and-back ride, so you can turn around and return at any time. If you would like to ride further, you can combine it with the Easier ride. 2. Continue straight at the Grasslands Trail. 3. Continue straight on High Road. 4. Turn right onto Crags Road, round the bend and climb the hill. 5. Continue straight at the bottom of the hill. *. Continue through the M*A*S*H site. 6. Continue straight on Crags Rd. 7. Bear right at the road to the dam. 8. At the dam, turn around and return. 7. Continue straight onto Crags Rd. 5. Bear left, up the hill. 4. Turn left onto High Rd. 3. Continue straight past Crags Rd on the right. 2. Continue straight past Grasslands Trail on the left to arrive at the beginning. The basic loop is 15 miles long with about 3000' of climbing. It is almost all fireroad except for three somewhat technical and fun singletracks, about a half mile long each. If you take the optional singletrack out-and-back to Kanan road, the total distance becomes 27 miles with about 6000' of climbing. This section is 100% singletrack and includes some challenging climbs. If 27 miles is too far, you can ride part way to Kanan Road before returning to the main loop. 6. Turn left up Bulldog and climb to the top. 11. At the Corral Canyon Rd parking lot, take the singletrack to the right if you want to take the optional ride out to Kanan Road. Otherwise, continue through the parking lot to the paved Corral Canyon Rd. 12. At "The Saddle," cross Newton Mtwy to the singletrack on the other side. 13. Cross Latigo Canyon Rd to the singletrack on the other side. 14. At Kanan Road, turn around and return. 11. At the Corral Canyon Rd parking lot, take the paved Corral Canyon Rd. to the right. 15. Turn left onto Mesa Peak Mtwy. Watch for ground bees! 16. Turn left and continue down Mesa Peak Mtwy (AKA Tapia Mtwy). 17. Bear right onto the singletrack. 18. Turn left onto Malibu Canyon Road, crossing the bridge (walk bike on bridge opposite traffic). Continue 200 yards past water treatment plant driveway on left, continue 200 yards past Piuma Road on right, continue 1/4 mile to entrance to Tapia County Park (State Park) on left. 19. Turn left into the Tapia Park. Make immediate right, continue 1/4 mile to next left, continue to end just before Salvation Army Camp. 20. Head up the Tapia Spur Trail singletrack on the right. 21. Ride through the gravel parking lot, down the gravel road and turn left onto the paved road. Ride back to the starting point.